China Plans To Create A Nationwide Carbon Market By 2017 : Parallels China is building what could be the world's largest carbon market. Pilot programs are helping to lower emissions. But this is mostly due to slowing growth and the shift away from manufacturing. The Beijing Environment Exchange, one of seven emissions trading pilot programs in China, may be part of a nationwide carbon market by as early as 2017. During important events in China in recent years — from international summit meetings to sporting events and military parades — the government has resorted to ordering smoggy skies to turn blue. Apparently, the skies dare not disobey. This involves ordering cars off of the capital's streets, and shutting down factories across much of north China. But China's leaders seem to realize that clearing skies by diktat is not a solution. As part of its pledge to cap carbon emissions by the year 2030, China is now building what could become the world's largest carbon market. This just furthers the contradiction: China is simultaneously home to some of the world's most polluted cities, and home to some of its most ambitious anti-pollution measures, including the carbon markets and big investment in renewable energy sources. I recently visited the Beijing Environment Exchange, one of seven emissions trading pilot programs around China. The country plans to create a nationwide carbon market by 2017. That, in turn, could be linked to international carbon markets. 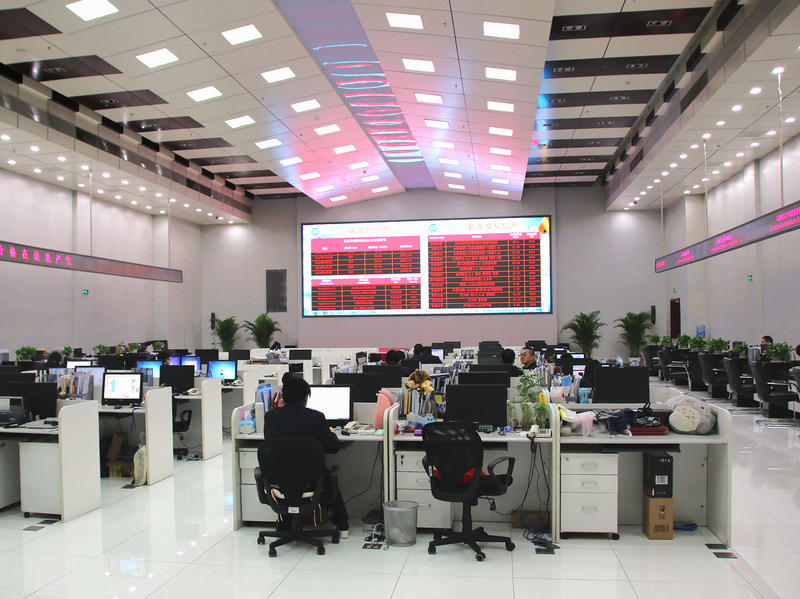 "What you see here are the two big trading boards," the exchange's director, Wang Yang, tells me, pointing to two large displays on the wall. "On the one to the left, you've got buyers, and on the right, you've got sellers. At the moment, people are selling." On the right side of the board, four sellers offer carbon credits selling for about $7.50. Buyers bid for the credits on their own computers. At present, Beijing companies that emit more than 10,000 tons of carbon a year are subject to emissions caps. The municipal government issues these companies free permits to emit carbon. If they emit less, they can sell the extra permits. If they emit too much, then they have to buy them. The government will allot the companies fewer permits each year. Institutional and private investors are allowed to trade credits on the Beijing exchange. In the two years since it opened, the Beijing pilot program has done pretty well, Wang Yang says. "It's put pressure, to some extent, on companies to reduce their emissions," he says. "And it's given them an incentive to get that bonus income from selling credits. It's helped Beijing to beat its targets for total carbon emissions." So far this year, China's capital is using less energy per unit of economic output than last year. Coal consumption has dropped, and the city's air looks and smells a bit cleaner than last year. But most of that is due to a slowing economy, and the shift away from manufacturing towards services, which emit less carbon. Alvin Lin, a Beijing-based attorney with the Natural Resources Defense Council, says the price of carbon is still too low to really motivate companies to invest in energy efficiency. "We want this to have an effect over 5 or 10 years," he says. The market putting a price on carbon is "really impacting how whole industries do what they do and it's really impacting long-term investment decisions," he says. "So it sort of makes clear that you can't keep building coal-fired power plants because in the future, the price of carbon is just going to increase rather than decrease." Zhang Zhongxiang, an economist and emissions trading expert at Tianjin University, not far from Beijing, says right now, China's carbon markets are plucking the low-hanging fruit. He predicts that once China's economy makes the transition from industry to services and consumption — as the U.S. has — reducing emissions will be much harder. "How do you reduce emissions then?" he asks. "Don't drive big cars and don't live in big houses. Changing people's behavior and habits is the hardest thing to do." As someone who researches carbon markets, Zhang says he is stymied by a lack of basic statistical data about how many permits the government is allotting, and how much carbon companies are emitting. Without this data, it's very hard to say how much carbon in China should cost. "The seven pilot cities have not made public companies' historic emissions or the amount of credits governments have allotted," he says. "This makes a lot of work difficult for us to do. It gives people the feeling that perhaps things are being secretly manipulated."